107 people have liked this story. Squeezing. Rubbing. Endless blisters. Poorly fitting footwear can create misery with every step. But when hand-me-downs are the only option, the kids will tell you that the pain can be endured – it’s the teasing that is unbearable. When the hallways are flooded with new clothes, new backpacks, and new shoes, students without feel like they stand out. 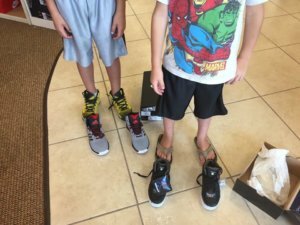 In response, the Salvation Army Washington Corps is helping local kids in need put their best foot forward at the start of the new school year by providing them with a new pair of shoes. Research indicates that if kids aren’t wearing proper footwear, they cannot focus in the classroom. Plus, thoughtless comments from their classmates can create an additional distraction. Each year, a group of volunteers, typically from a sponsoring business, accompany qualifying kids and Salvation Army representatives on a shopping trip to the Famous Footwear at Trinity Point. In addition to providing comfort, the new shoes also boost the children’s self-esteem. In fact, it is not unusual for the Salvation Army Washington Corps to receive touching thank you notes from the children who have been helped. Some even write about how they are no longer made fun of by their peers for wearing shoes that are far too big or in disrepair. With enough support, the Salvation Army Washington Corps hopes to take 100 children shoe shopping this summer and help 200 happy feet step confidently into the new school year.